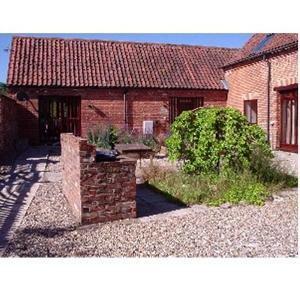 Station Farm Barn01353 720419work Self-cateringStation Barn Farm consists of three charming and original, red brick and flint 18th century adjoining barns providing luxurious and flexible, self-catering breaks in the heart of the stunning North Norfolk countryside. The cottages are built in an L-shape around a sheltered garden/patio area with a brick built barbeque and are situated in approximately one acre of land, providing lots of space for children to play in safety. We are located in Thursford, home to the Thursford Collection, with the largest collection of steam engines and fairground memorabilia, including a Mighty Wurlitzer, which is the fourth-largest in Europe and has a total of 1,339 pipes. In 2002/2003, we took great care to tastefully convert our family friendly cottages and have developed and equipped them to a high standard of comfort, whilst still maintaining many of the original features typical of the North Norfolk building style. Each cottage is self contained with a modern electric oven, hob, microwave, fridge/freezer and dishwasher. Lounges are equipped with TV/video and hi-fi. We specialise in larger groups with each cottage sleeping 5-6, or 17 in all three, making it especially ideal for large families. Master bedrooms have double beds, with the other bedrooms containing two single beds and in Kestrel and Owl cottages extra sleeping space is provided on a sofa bed in the lounge. Duvets and bed linen are provided, but we ask you to please bring your own towels. Cots and high chairs can be provided upon request at no extra charge. The thick walls make for a very quiet space which is cool in the summer and warm in the winter, although electricity and oil fired central heating is included in the price. • Sheringham Park (NT) containing a unique collection of Rhododendrons and azaleas. Station Barn Farm operates a unique pricing policy, which is strictly seasonally based (except for Christmas and Easter), and actively seeks to ensure there are no price hikes for half-term holidays. A “smoothed out” summer tariff supports and welcomes guests with children. Holidays longer than one week also attract a generous £20 per holiday discount. Station Barn Farm consists of three charming and original, red brick and flint 18th century adjoining barns providing luxurious and flexible, self-catering breaks in the heart of the stunning North Norfolk countryside. The cottages are built in an L-shape around a sheltered garden/patio area with a brick built barbeque and are situated in approximately one acre of land, providing lots of space for children to play in safety. We are located in Thursford, home to the Thursford Collection, with the largest collection of steam engines and fairground memorabilia, including a Mighty Wurlitzer, which is the fourth-largest in Europe and has a total of 1,339 pipes. As a rule, our holidays start on a Saturday. Short stays of three days are available between October and the end of April, where we offer a substantial 65% discount off the normal weekly cost of a stay (excluding Christmas and Easter). Find yourself with a few days spare in the summer? Call us, as we may be able to offer some great deals on last minute short stays. Sorry, we regret that we are unable to accommodate pets. On the A148 approximately 5 miles north east of Fakenham. The buildings are a conversion from a traditional Norfolk barn and are not suitable for access to people with anything more than slightly impaired mobility.